I read some stats the other day. 13% of teen girls have been physically abused by a boyfriend. 26% were repeatedly verbally abused. 25% were forced to engage in sexual activity. More than half of America's teens know a friend who has been abused in some way by their significant other. These numbers brought back a memory of a girl I knew. She came to church every week with her boyfriend. She was 16. He was 20. I watched her during service as she listened to the message and watched what unfolded. She was really in to it. Somewhere about 2/3rds of the way through the service he would receive a phone call and walk outside. Within minutes, he'd walk back in and tap her on the shoulder. She followed him out every time. I knew something was up. Control. An unhealthy relationship. She wanted God, that was clear, but she wanted this guy too. Even when she felt her Heavenly Father tugging on her heartstrings, the tap on her shoulder from the guy in her life was what she knew to follow. One night after service I walked through the church making sure the doors were all locked. It's a big church and easy to feel swallowed up in the darkness of the long halls. The lights were out and I heard voices. I tried to see who was ahead but it took time for my eyes to adjust. They didn't see me, but suddenly I could see them. She was walking away quickly. He pushed her in her back, taunting her, calling her names that didn't belong in a temple of God--whether made of stone or the beautiful young girl made by God. She stumbled and turned to defend herself. Then he kicked her--hard. Right in the back. He called her another name. I called out his name and he twirled around, surprised. I talked to him, but later, privately, I talked with her. I tried to explain that her guy's love was anything but. I tried to paint a picture of what her life might be one day--isolated, broken, caught between the love of her abusive husband and normalcy, trying to protect the kids from daddy. I told her that there were women who would give anything to be in her shoes right now -- young enough to walk away because the situation wasn't complicated with children, able to pursue her dreams and find good love. She confided that she wanted to be a doctor. She was a 4.0 honor student. She wanted to help people, especially children. I also told her, "you are worth more than this, sis." Later that night the youth pastor called her parents, but the girl convinced them it was just an argument. I ran into her the other day. She's working as a waitress. She's 19 now and they are married. She had a bruise on her neck that was purple and yellow. She looked old. It's still not too late, I said. "I love him," she said simply. She doesn't get it. She doesn't understand that real love is generous and nurturing and that God never intended relationships to look like this. I hope you get it. I hope that you understand that there are women--like me--who have been married for a lot of years who feel safe and passionate, in love and protected by an awesome godly man. I still have fun with him. I love hanging out with him. My children (and one day their children) are marked and shaped by their dad, a very cool man who knows how to love in all the right ways. Don't accept less than real love--from your Heavenly Father and from the guy or girl you allow into your heart and life. 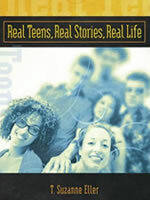 T. Suzanne Eller is the author of Real Teens, Real Stories, Real Life and can be contacted at realteenfaith.com or at tseller@daretobelieve.org.